If I have calculated correctly, there are 14 days of April left so when I saw this on Hannahkimberly22’s Blog I knew I just had to have a go to see me to the end of the month! So today’s post is all about my favourite foundation and to be honest i’m yet to find one that 100% ticks all my boxes. So…. to put it mildly, i’ve kinda cheated with today’s post, sorry! I’ve split it up into favourite BB cream, favourite everyday foundation, favourite evening foundation and a little bonus at the end! 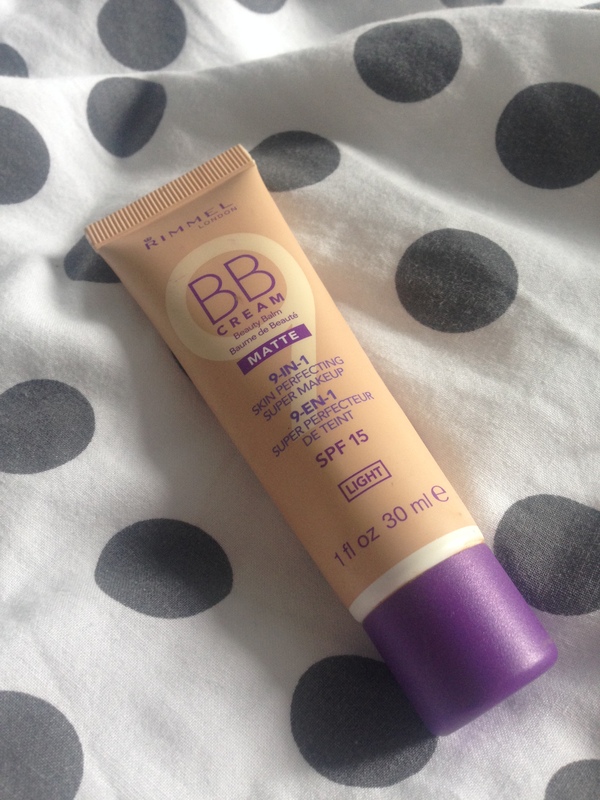 Rimmel London 9-in-1 Matte BB Cream – This is a lovely lightweight base that I like to wear in a few different ways or for a few different occasions. Firstly, it’s great for lazy days, Sunday’s, good skin days, summer days…. the list is endless. I wear the colour light and it suits me all year round as it blends in really easily and it also has spf 15 in which is particularly helpful throughout summer! I also sometimes use this as a primer if I want to even my skin tone out or add a bit of extra moisture to my face. I don’t know how it works but it definitely makes my makeup go on smoother. Finally, if I have applied foundation, but it looks a bit flakey around my dry patches, I buff a layer of this on top of it with my real techniques buffing brush and it just seems to right itself. Again, don’t ask me how but it’s some kind of miracle fix for those bad skin days, however you use it! It retails for £6.99 and is available from Boots and as a bonus, it’s currently on 3 for 2! 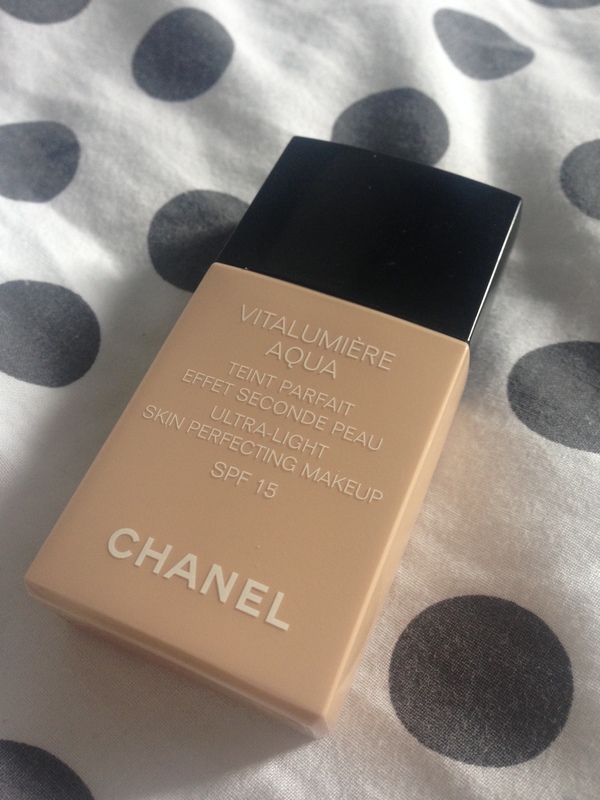 Chanel Vitalumiere Aqua – This is such a lovely lightweight foundation. It is water based and you have to shake it up before using which I quite like to be honest. It feels lovely on the skin and 30ml really has lasted me a long time! I bought it in September last year on a shopping trip with my friend Nicola (who also has a lovely blog by the way, you can check it out here) and I still have some left now and i’ve pretty much used it daily.This also has spf 15 in it which is a nice level of protection for a daily foundation, I quite like the smell of it too, and the packaging is nice and sleek. It’s pretty pricey at £33.00 however, I do feel like it’s worth it and I’ve definitely got my money’s worth! I wear the colour 20 Beige but to be honest, 10 Beige AND 30 Beige all matched me too so there can’t be that much of a different between the shades. 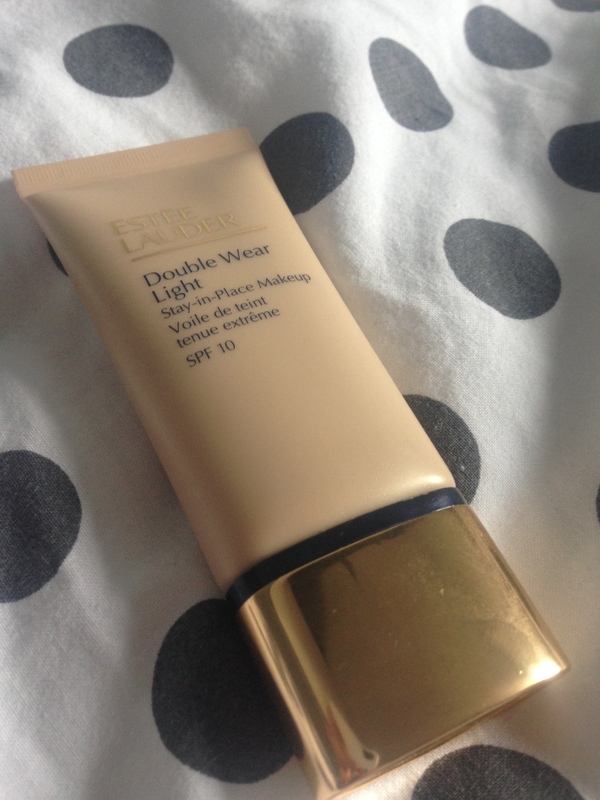 Estee Lauder Double Wear Light – Now I tried the original double wear and found it way too heavy for my skin, I have those funny lines across my forehead which my boyfriend likes to call my ‘Gordon Ramsey’s’ and the double wear just sat in them. Attractive, I know! So the lady on the counter suggested the lighter version and I do really like this. It does last pretty well and has a lower level of spf than my other foundations (it has spf 10) so causes less flashback in photos. It’s quite easy to blend and the packaging is nice and practical. Is it my favourite foundation ever? No, but for the time being I do like the finish it gives. I wear intensity 2.0 which seems to be quite a good match for me now yet also has the capability of matching me with a tan too if that even makes sense? Apologies for anyone on a budget, but this is another quite pricey one at £29.50. I am a bit of a believer in ‘you get what you pay for’ with foundations although I know that there are some good drugstore ones out there which I am yet to try so please leave me any ‘purse friendly’ options in the comments! I’m nearly out of my Chanel and I am a little hesitant to fork out another £33.00 as I am always searching for the ‘does it all’ foundation which I don’t even know if it exists!! Now, seeing as i’ve well an truly cheated anyway today, I thought i’d throw in this little extra that arrived through my door today. 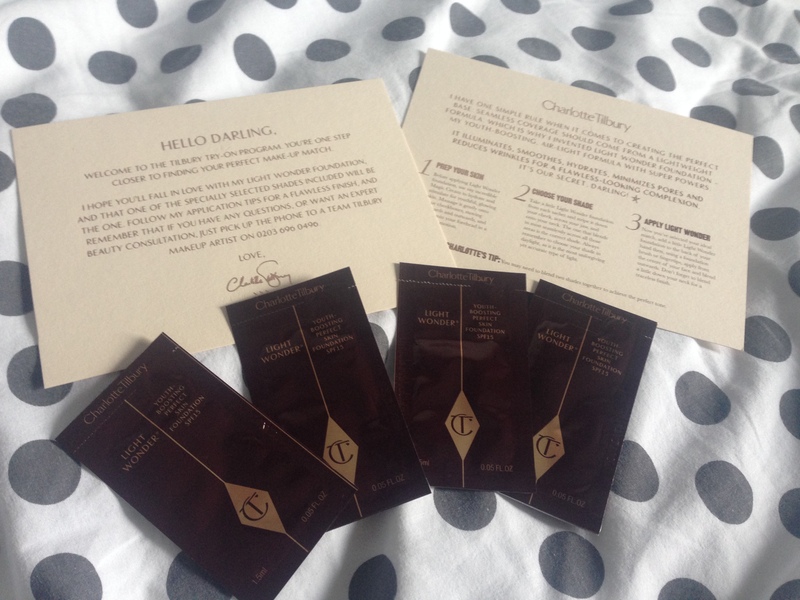 A couple of weeks ago, I was lucky to be quick enough to order one of the Charlotte Tilbury Try-On Programs. Now, I don’t live close enough to anywhere that sell Charlotte Tilbury to be able to try anything out, which to be honest, I think my purse is grateful for! However, I have heard that her Light Wonder Foundation is like my Chanel foundation but with a little extra coverage. This was all sounding like music to my ears already, so when I saw she was sending out samples to help you find your colour match so it was easier to order online I was all over it! I ordered the set in Fair which consists of four different fair shades and although I am yet to try it I just love the feel of it all, from the embossed note cards that came in it to the burgundy and rose gold packets, it just screams quality. I may be wrong (although I highly doubt it!) but I think I am going to LOVE this! I will let you know how I get on and I am sure I will be placing an order shortly. I am just so glad to finally get my hands on something Charlotte Tilbury, even if it is just a freebie!! Oh I like this! Great post! Do you mind if I steal this 14 days of favorite makeup challenge from you? Or is one that you have to get nominate for?